India today got a symbol for the Rupee, denoting the strength of its economy, and joined a select club of countries whose currencies have a unique identity which includes US dollar, British pound, European euro and Japanese yen. The symbol was designed by D Udaya Kumar, who is with the Department of Design at IIT Guwahati. Explaining the significance of the design, he said it is based on the Indian Tricolour. "My design is based on the Tricolour with two lines at the top and white space in between. 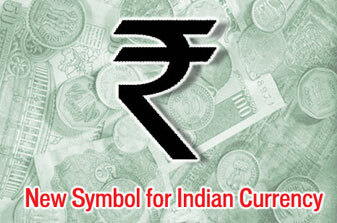 I wanted the symbol for the Rupee to represent the Indian flag," said Kumar. The cabinet approved the symbol - an amalgam of the Devnagiri 'Ra' and the Roman capital 'R' without the stem and two parallel lines running at the top. The parallel lines symbolise the equal to sign. "It denotes the robustness of the Indian Economy",said Ambika Soni,Minister of Information and Brodcasting. The need for the symbol had become necessary because of the Indian economy's rapid growth, which has propelled it to become one of the largest economies of the world. The symbol will distinguish the Indian currency from currencies of other countries like Pakistan, Nepal, Sri Lanka and Indonesia which also use the word "rupee" or "rupiah" to identify their respective currencies. Other than giving Indian Currency a new look and an International recognition, it won't help Indian economy any further. It may result in wastage of less paper and it may save time but other than that it won't do wonders.